Tonight on ABC at 8 p.m. ET, be prepared for scares that go to infinity and beyond. With “Toy Story of TERROR!” Disney Pixar brings us their first special for television featuring our “Toy Story” faves, including Tim Allen and Tom Hanks reprising their roles as Buzz and Woody. In addition to the toys we’ve grown to know and love, we’ll also be re-introduced to the G.I. Joe-ish “Combat Carl” (Carl Weathers). Even though we briefly met him in the first “Toy Story,” Carl steps in to help defend the toys when in danger. 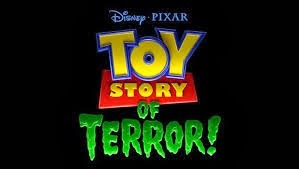 “Toy Story of TERROR” isn’t your typical Halloween special though. Not only will the kiddies enjoy the tale but adults will jump a couple of times too. Seriously though, adults love this franchise just as much as kids do, right? Who DIDN'T cry at the end of 2010's "Toy Story 3?" What starts out as a fun road trip for the "Toy Story" gang takes an unexpected turn for the worse when the trip detours to a roadside motel. After one of the toys goes missing, the others find themselves caught up in a mysterious sequence of events that must be solved before they all suffer the same fate in this "Toy Story OF TERROR!" They also highly recommend that “Toy Story” fans, and even non-fans, tune in to ABC tonight at 8 p.m. for the fun.